Last week, after a year of behind-the-scenes work and much public debate, California’s big three investor-owned utilities turned in their long-awaited distribution resource plans (DRPs). Mandated by state law AB 327, these DRPs are essentially blueprints for how Pacific Gas & Electric, Southern California Edison, and San Diego Gas & Electric are going to merge rooftop solar, behind-the-meter energy storage, plug-in electric vehicles and other distributed energy resources (DERs) into their day-to-day grid operations and long-range distribution grid planning and investment regimes. A lot of work has gone into these plans, much of which had never before been done. 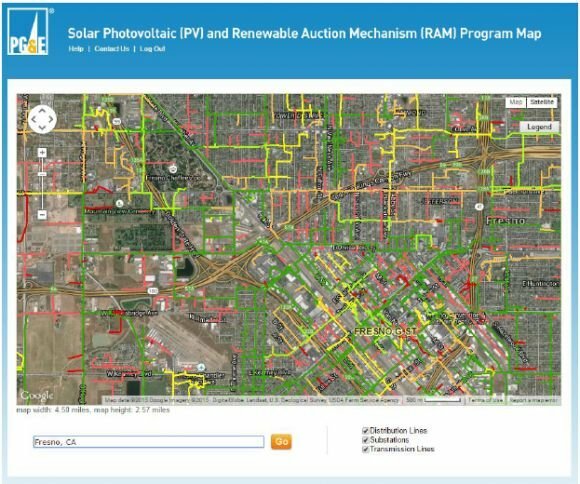 Each California utility has created mapping tools that show how much capacity is available on each distribution circuit for new DER interconnection, for instance -- something that could be very useful for distributed energy developers. All three utilities have also agreed on a common set of measures for how DERs could help shore up grid capacity, increase reliability, serve system-wide needs, and otherwise stand in for costly utility upgrades. And each has laid out how it plans to fold these DRP methodologies into their general rate cases (GRCs), the once-every-three-years process that determines how much each can charge its customers for its capital and operating costs for the coming years. But when it comes to actually turning these software tools and financial guidelines into real-world DER-grid integration, the hard work has just begun. Many questions remain about how to determine which combination of DERs will meet the least-cost models that utilities use to rank their distribution grid upgrades, and what kinds of new capabilities grid-supporting DERs will need to have to serve as replacements for utility investments. These issues are of major interest for solar-storage combinations from SolarCity and Tesla, SunEdison and Green Charge Networks, Sungevity and Sonnenbatterie, and SunPower and partners Stem and Sunverge, which see an opportunity for earning grid services revenues as stand-ins for distribution grid investments. 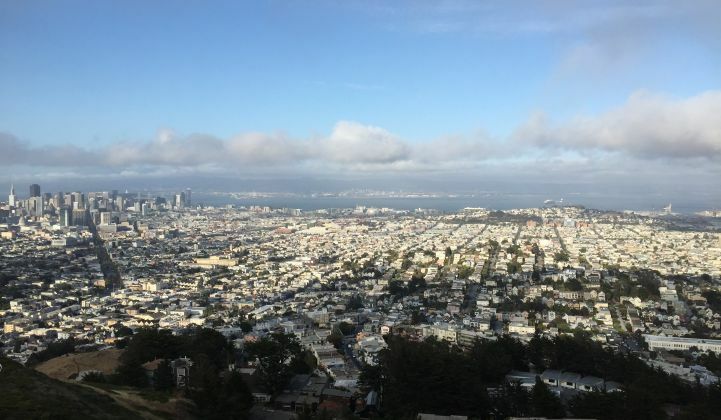 They’re also important for the commercial building and residential energy management platform providers looking for ways to tap California’s emerging opportunities for distributed demand response. But these costs and values wouldn’t just flow from utilities and their customers to DER providers. Each utility’s DRP asks the California Public Utilities Commission (CPUC) for permission to spend lots of money on beefing up their own systems to enable their visions. 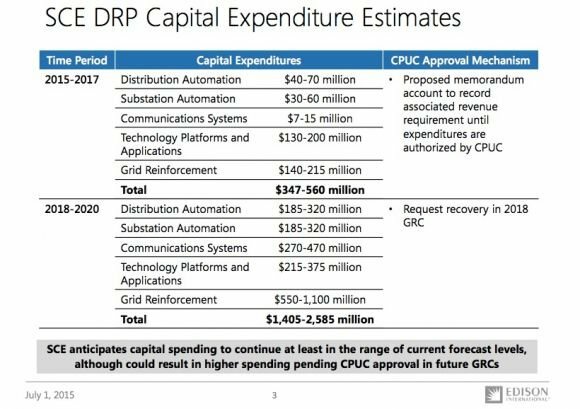 Southern California Edison alone is estimating its DRP-related capital expenditures could add up to $347 million to $560 million over the next three years, for example, and PG&E and SDG&E will also be seeking new funding, though they haven’t yet specified how much. All three DRPs add up to nearly 1,000 pages, which makes it hard to summarize all the next steps they contain. But here are a few highlights of the challenges to come. Today’s distribution grid planning presumes the one-way flow of electricity from substations to end customers with fairly predictable consumption patterns -- low at night, rising in the morning, falling slightly at midday, and rising to a peak in late afternoon or early evening. But a world of DERs will be far more dynamic -- and that requires a more dynamic way to model and manage their impact. For instance, at PG&E, “We have to figure out what some of the impacts are to our transmission system, in terms of reliability and energy,” Hogan said. “Even the impacts of distribution switching need to be evaluated. On a minute-by-minute basis, things happen on the system” as utility operators open and close switches and reroute power from one part of the grid to another. In that sense, the circuit-by-circuit DER penetration maps that California’s utilities have built are “almost creating a theoretical max, if you will, and recognizing that things like switching and transmission constraints will cause other impacts,” he said. That means that, while the new mapping tools will help developers make some early decisions about where to target DERs, “folks are still going to have to follow our processes in terms of making an interconnection. Even though you’re breaking down 5,000 feeders into five sections, depending on section, on wire size and transformers, you may have some constraints” that don’t show up in the static models. There’s also the matter of controllability, or in utility parlance, dispatchability. Some DERs are relatively uncontrollable in terms of their effects on the grid. Rooftop solar, for example, pumps out energy when the sun’s out and stops when clouds pass overhead. As more and more rooftop solar comes on-line, driving down grid consumption, it can cause energy demand to plummet at midday and then rise steeply in the late afternoon, disrupting predictable peak load patterns -- think of the “duck curve” problem for California’s grid operator, CAISO, only at the individual circuit level. While “smart inverter” technologies can help provide some voltage regulation and reactive power support for grid circuits affected by these kinds of DER generation patterns, they can’t shift solar generation from midday to later in the afternoon. Other DERs, like energy storage systems, EV chargers, or demand-response-enabled air conditioners and appliances, can be more controlled to mitigate these disruptions -- but only if they’re somehow linked up with the grid’s needs. Each utility’s DRP notes that it would like to have some level of control over those assets, if they’re to become part of its distribution investment plans. That could enable battery-backed solar systems to absorb power during midday and discharge it when those late afternoon peaks are about to start, smoothing out the “neck” of the duck curve. To help manage these combinations of edge-of-network energy assets, each utility says it will need a distributed energy resource management system, or DERMS. San Diego Gas & Electric has been piloting a DERMS platform from Spirae, but “anticipates the need to install additional data-gathering and operational equipment,” according to its DRP filing. PG&E, for its part, says it needs a DERMS platform to control such things as “multi-layer optimization” of multiple DERs, to perform “constraint-based forecasting and control,” and to enable a “lightweight distributed computing framework” to allow distributed assets to manage problems that arise too quickly for centralized control systems to be able to react to. That kind of distributed intelligence is being tested in utility pilot projects around the country, but it hasn’t yet become a part of everyday operations. It starts with getting a better handle on all the data coming from smart meters, grid sensors, and non-utility systems to create a more accurate picture of what’s happening on the grid. PG&E has tapped Bit Stew to provide software for its Grid Operations Situational Intelligence project, which is experimenting with this kind of operational visibility, and SDG&E and SCE have also hired the Vancouver, Canada-based startup for similar work. Over the next few years, each utility plans to conduct demonstration projects to test these capabilities in the field. SCE’s pilots will be concentrated in the parts of Orange County where it’s already deploying DERs to bolster local grids that have lost the capacity and stability provided by the shuttered San Onofre nuclear power plant. SDG&E is planning demonstrations at its Borrego Springs microgrid and at other unspecified locations, and PG&E is targeting solar-rich Fresno County for its DERMS tests, as well as utilizing Angel Island in San Francisco Bay for a microgrid project. As for how all of this will be turned into business-as-usual for grid planning, SCE suggests that the CPUC create a Distribution Planning Review Group (DPRG) process, similar to the reviews of utility activities in wholesale energy procurements, to give DER providers and other stakeholders a chance to play a role. The utility also suggests that the contentious issue of data-sharing between utilities and DER providers be worked out in workshops over the coming year (we’ll have more on this issue in a follow-up story later this week). So far we’ve discussed the challenges of integrating DERs into hour-by-hour and day-by-day grid operations. But there are also long-term considerations that need to be taken into account -- namely, just what all these new distributed energy assets will do to the grid over the years to come. The same issue will apply to individual circuits facing peak constraints. 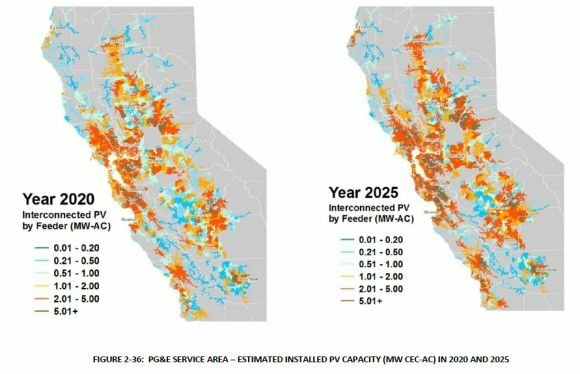 A recent UC Berkeley study found that distributed solar could provide a lot of value for the 10 percent of PG&E’s distribution circuits facing peak capacity upgrades in the near future. But this value quickly decreases once there’s enough solar on the circuit to reduce its peak load below the threshold that would have required upgrades. Being able to predict just how these complex interactions will play out over years to come, in order to fairly compensate different DER deployments for their grid value, requires a combination of traditional grid planning with more esoteric skills. We’re talking about things like modeling how population growth and economic development will affect how much DERs get built from circuit to circuit across the state, and how to translate those future needs into today’s compensation schemes. This kind of ground-up reworking of long-term forecasting of grid needs from the circuit to the state-wide grid will take some time. 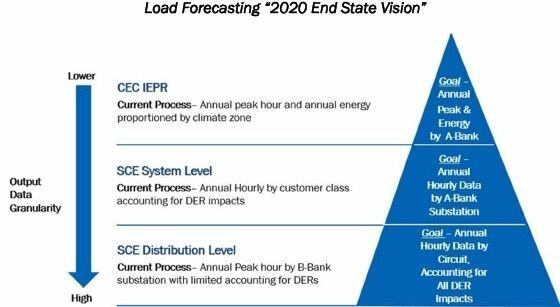 SCE’s DRP suggests a “long-term plan (3-5 years) to revise the forecasting process,” building on hourly output for each circuit with DERs and aggregating them to the sub-transmission and transmission scales. One big challenge for this long-term analysis is how to avoid “double-counting” DERs that would have been deployed anyway for economic reasons outside of distribution grid support. That’s because almost all behind-the-meter DERs, whether they’re “soft” resources like improved energy efficiency or “hard” resources like solar PV arrays, are now considered as “load-modifying” -- that is, their effect is calculated as a reduction of amount of electricity demand from end customers. The most likely solution to this will be for utilities to obtain grid-supporting DERs either through contracts, such as those SCE has used for its West Los Angeles Basin region, or through the creation of new tariffs purpose-built for combinations of DERs to be put to use for grid needs. All three DRPs have long sections about how they’d like to set up contracts and/or tariffs to accomplish these goals, including some noteworthy ideas that go beyond business-as-usual to suggest new revenue streams and business models for utilities in a future filled with DERs.